Cities may come in all sizes and shapes, cultures and habits, histories and topologies but still remains one seemingly common denominator across all: the pedestrian. Yes, people in New York walk faster (but slower than Singapore, apparently, though the study discounts pedestrians using their phone while walking, which accounts for 90% (data mine, totally objective) of everyone), people in Bangalore seamlessly move from sidewalk to the road, people in Hong Kong know to arrange themselves in queues in congested areas, but even these specificities can be explained away by the particular conditions in which they happen. One constant aspect of the pedestrian behaviour may be that, as bipeds, we are optimisers: we seek the fastest, or most visually exciting, or most weather-appropriate route to reach our destination. Our optimising criteria are up to us and our personal preferences, but remains that we seldom leave our routing decisions to chance only. These preferences act as forces that guide us along the way and together they create the pedestrian flow. This flow is diverse because we all respond to different constraints, but I want to argue here that every urban planning effort needs to go in the direction of the pedestrian flow. A related proposition would be that every urban planning effort that runs contrary to the pedestrian flow generates bad outcomes, and that proposition can readily be seen via several examples. The takeaway is simple: to reap the benefits of good urban planning, follow the flow! For more safety, follow the flow! Three things have peeved me throughout my stay in Singapore as a pedestrian: pedestrian overhead bridges, push-to-walk buttons at pedestrian crossings and fences. I have written extensively about overhead bridges before but the intuition readily carries to the other two situations. All three are public infrastructure that is designed in such a way that it is consistently in opposition to the pedestrian flow, because it is always faster to jaywalk under an overhead bridge, or slower to ask for the signal at pedestrian crossings, or longer to detour around fences. The result is that pedestrians are rationally inclined to put themselves in unsafe situations, made more unsafe by the public infrastructure that was built. As an aside, though these exact three examples have stuck to my mind for a long time, I was pleasantly surprised to see all three of them indicted as especially bad urban design in Streetfight by J. Sadik-Khan, with a paragraph on pedestrian bridges in J. Gehl’s Cities for People. An overhead bridge is a ground pedestrian crossing that was not built, exposing jaywalkers to cars. “Jaywalker” does not even feel appropriate: pedestrians are expected to cross the road, since the infrastructure was built there. But they are not expected to cross on the road, and are provided with a slower, more effort-consuming option — or downright impossible to cross for seniors or persons with disability. Again, more on that here. In Singapore, the Land Transport Authority has developed a system to ensure drivers will hit a string of green lights while on the road, poetically called GLIDE. While efficient for drivers, it translates to a poor experience for pedestrians who are required in most intersections to physically push a button to request for the signal. That signal may come after up to 100 seconds (as I counted near my place), to cross a two-by-two bidirectional road. The result is simple: most pedestrians wait for a chance to cross at any point, more so because the crossing leads to a bus stop and buses frequently have enough time before the red light to alight passengers at a previous stop. The frustration of seeing the bus alight once two hundred meters before the crossing, then pass the green light and stop again at your stop while you are still waiting after a minute and a half is enough for many people to try crossing anyway, putting them in an unsafe position. Pedestrians, unlike cars, are nimble and it is difficult to physically stop them from going where they want to go. In that respect, fences are a funny system: one gap in the fence is enough to invalidate the rest of the infrastructure, so you want to be as comprehensive as possible. But effort-minimization is a powerful force, and it is almost certain that pedestrians will find a way to bypass the fence somehow. Then the more area your fence covers, the more unsafe it is: Once behind the fence, on the road, it is difficult for pedestrians to return back to safety because everything is separated away. 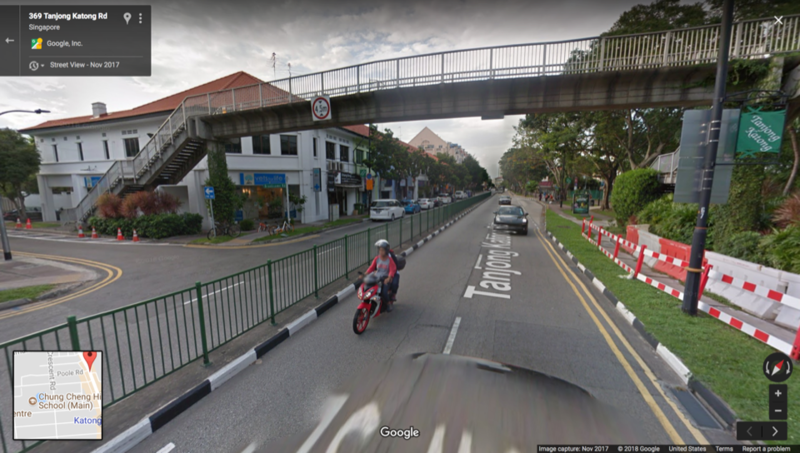 The nightmare scenario of an overhead bridge supplemented with fences to avert pedestrian crossing, on Tanjong Katong Rd. The closest official crossing to the North is 450m away and to the South is 100m away, with the pesky push-to-walk button and long wait problem I have described. No surprises: I have rarely seen anyone use the pedestrian bridge, I have consistently seen people crossing at the red light in the South pedestrian crossing and at the exact point where the fences stop to the North. Why bother with all this infrastructure if the realised conditions equalise that of a road with no crossing, no bridge and no fences? The opposition is that, in all these examples, the pedestrian is at fault, and thus the system works well but bad users are abusing it, a point I attempted to rebut in my previous article on system thinking. Ask yourselves if, when and why you acted against how the system was designed? Or the last time you got stuck behind a fence and had to make your way out of a road? If you are a perfect being that answered never to both previous questions, consider from your Vulcan point of view what your fellow humans are doing: they are walking under pedestrian bridges, they are not waiting for the signal to turn green if pushing the button offers them a much-delayed crossing and they certainly jump fences when they can and sometimes get stuck behind them too. So bad infrastructure invites bad behaviour, but there is another way safety and the pedestrian flow are linked. Spaces that run contrary to the flow will see a diminished pedestrian activity and depopulate the “eyes on the street”. Is it a wonder why muggings always take place under a seedy highway underpass in every conceivable movie? Spaces that do not invite people to flow will inherently create unsafe conditions. They may not be necessary routes to most people who will avoid it but for the few whose livelihood depends on crossing that underpass, they considerably increase the chances of a bad encounter, away from everyone. For more money, follow the flow! Another frequent counterargument is that of efficiency: overhead bridges allow cars to move faster and push-to-walk signals stop traffic only when necessary. This notion of efficiency is not without merits: congestion does impact negatively pedestrians, if only by increased pollution, so it is certainly a good idea to keep the cars moving. But less is said of the economic opportunity that is lost when the pedestrian flow is impeded. Visually arresting spaces are important to pedestrians and denser neighborhoods have always fostered greater economic activity. If it is easy for me to reach the opposite side of the road to check out this shop or café, I will do so naturally. If my flow is upset by the difficulty of crossing a highway-sized road, I might not bother, even as that is a subconscious evaluation on my part. 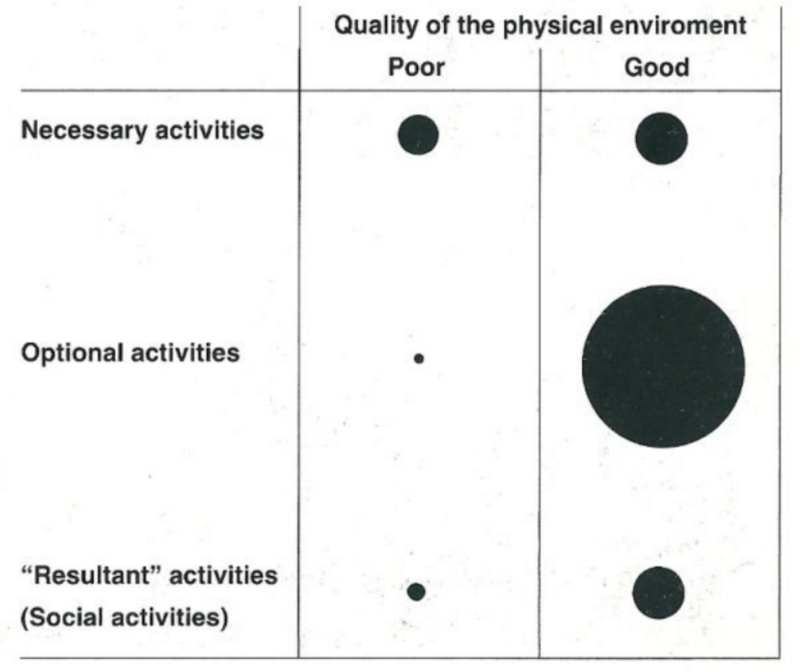 It is not surprising to see here that the areas cultivating a greater activity on the streets are the ones where the roads are smaller and where pedestrians can easily flow. Conversely, it is not rare to see malls or stores closing when they set up shop in places that are difficult to reach. This may help explain why most of Singapore’s retail activity seems to concentrate in malls, and malls next to train stations. Again, that is not a terrible thing per se: it is convenient, safe and malls are air-conditioned, a welcome relief from the heat. But the counterpart is that on the street-level, it often feels like an unforbidding urban desert where little is happening. Singapore’s conditions certainly disincentivise spending too much time in the heat on foot: for instance, some data we collected showed that most students out of a school would prefer to take a bus for two stops (about 700 metres) instead of walking that distance in an unshaded sidewalk. However on many levels, it would be a dishonest proposition to claim that walking can be eliminated. You do have to walk to your nearest bus or train stop, especially so if you do not own a car, which is the case for the majority and in particular for lower income citizens. The pedestrian flow matters then to allow economic activity that does not rely on customers coming in and out with a car. An ice-cream parlour could open in these 700 metres from the school if the pedestrian flow is embraced by installing an infrastructure providing shade, creating a few jobs in the process. This example is not simply anecdotal: cities everywhere are reaping the benefits of a more walkable (or cyclable) approach to urban design. It may also be one of the most powerful mechanisms available to alleviate some of the inequality that transportation generates implicitly by isolating whole blocks of residents. Follow the flow, follow the flow! There are a lot more reasons to follow the flow: incentivise resultant pedestrian activities and you may well get a spontaneous tai-chi spot, art corner or concert space. On a cognitive level, it always feels nicer to own the city while walking around on two legs, knowing that your own natural forces of optimisation will lead you to your destination or somewhere compelling rather than to a complicated mix of orthogonal infrastructure standing in your way. This is a difference I have found in Hongkong which, with the same (or worse) land constraints, integrates pedestrian infrastructure much more harmoniously with residential, civil or vehicular infrastructure than Singapore (but more so on the island than on some of the “new cities” in the peninsula).